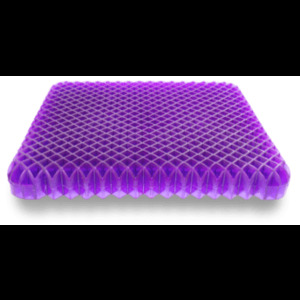 Royal Purple® Size: 18“ x 16“ x 2“ Weight: 5.4 lbs The world's most comfortable seat cushion. Seriously. Life is a pain in the gluteus. Now sitting doesn't have to be. Open airflow design keeps your keister cool and comfortable. Purple Seat Cushions keep their shape and never leave a booty impression. The 2-inch Royal Purple® Cushion is the popular choice for office heroes, drivers, authors, and artists. Anyone that spends most of their day seated. Hyper-Elastic Polymer™ The material that makes Purple® what it is. Who knew comfort could be so incredibly stretchy and incredibly durable? Pressure-Releasing Comfort The Purple® grid pattern is designed to fold and collapse under pressure. Comfortable even when you are sitting on your keys or your wallet. Free Air Flow The columnar design allows air to move freely, preventing heat and moisture form building up and keeping you happy and relaxed all day long. Cooling Comfort With its excellent airflow design and being made of cooling material, your duff will always be the perfect temperature.